Plenty of ameneties in the room. Close to station. Conviently located near the station so we could drop bags, easy walk to Peace Park, trolley system, nice view. Rooms were clean and comfortable. Very close to the station, nice bathroom, comfy bed. The staff are helpful and there's a restaurant on site if you are tired after traveling. Very helpful staff. They helped get my luggage to Tokyo. Check in was simple, as was check out. The staff had good English and were ready to help as soon as you walked in the door. The room was bigger than most in Japan, even if only slightly. The bed was comfy and the pillows were great. The bathroom was well stocked with toiletries and the room was clean. Its easy to find from the main station. The staff was friendly, the view was nice and the cost was desirable. Bus station is convenient and easy to is from hotel. 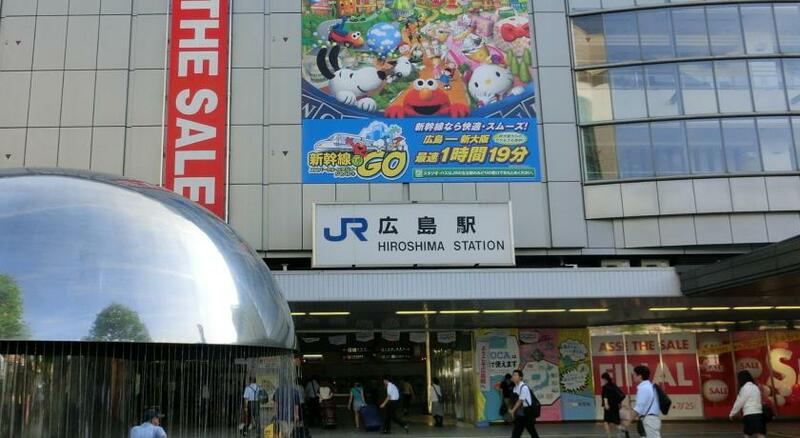 Convenient location (roughly 10 minutes from Hiroshima Station and 20 minutes from the downtown core area and 30 minutes away from the Hiroshima Peace Memorial). Staff are friendly, rooms are rather spacious and very clean. The hotel was the perfect price for what we got. It is old and needs to be renovated. APA Hotel Hiroshima Ekimae This rating is a reflection of how the property compares to the industry standard when it comes to price, facilities and services available. It's based on a self-evaluation by the property. Use this rating to help choose your stay! One of our best sellers in Hiroshima! APA Hotel Hiroshima Ekimae is a 3-minute walk from JR Hiroshima Train Station and a 10-minute drive from the Atomic Bomb Dome. It offers free Wi-Fi throughout the property, while rooms have an LCD TV and in-room massages are available. Rooms at Hiroshima Ekimae APA Hotel are simply furnished and come with an private bathroom, a fridge and a desk. You can put on a Yukata robe and watch a video-on-demand movie, for a fee. All rooms are air-conditioned. Hiroshima Castle, the Hiroshima Art Museum and Shukkei-en Garden are all a 10-minute drive from the hotel. Three convenience stores are within a 3-minute walk. Laptops can be rented and luggage can be stored at the 24-hour front desk, and the lobby has a coin-operated internet PC. A breakfast buffet is served at Morning Ace, for a fee, from 06:30-10:00 (no entry after 09:30). When would you like to stay at APA Hotel Hiroshima Ekimae? Simply furnished room with an private bathroom, a fridge and a desk. Yukata robes are provided and video-on-demand movies are available for purchase. All rooms are air-conditioned. House Rules APA Hotel Hiroshima Ekimae takes special requests – add in the next step! APA Hotel Hiroshima Ekimae accepts these cards and reserves the right to temporarily hold an amount prior to arrival. Please note, guests who plan to check-in after 22:00 must notify the property in advance. Reservations for guests who do not arrive before 22:00 and do not notify the property in advance will be canceled. Please inform APA Hotel Hiroshima Ekimae of your expected arrival time in advance. You can use the Special Requests box when booking, or contact the property directly using the contact details in your confirmation. The air conditioning didn't work and it was hot like summer. The worst was that the neighbour was a chain smoker. Just found it hard to fall asleep. Warned about possible noise disruption throughout the night only on arrival. This happened right outside the room throughout the night and was loud building work and made it a pointless hotel as we couldn’t sleep. 1 flat pillow each and both woke with backache. Unacceptable sadly. Single room was tiny. I’m 6’2” and the room is about 6’5” wide. It was a very cozy and cute room. Super clean, dry nice bathroom. For keeping the rules of selective garbage collection I was rewarded with mineral water. Good location to connect transportation. No ventilation: the air in the room was super dry. Thin wall: you could hear people from the next room. Strong smell of sewage in two rooms that I booked. Window was broken in room so it couldn’t be locked, we were travelling with 2 young kids and on a high floor, very dangerous. Massive crack down one of the walls, so big even the wall paper was ripped down the middle. The only window in the room was tiny and frosted over. The room and hallways were very dark. There was only one pillow. Great location,close to station. Friendly, helpful staff. Room was small but functional. The amenities in the bathroom were nice.